It’s super rare that I accept maternity clients but when a local photography pal of mine reached out to say how darling this couple was, I couldn’t help but say yes! Adleigh & Chace are a photographer’s dream. They trusted any pose that I put them in and had fun with each other! 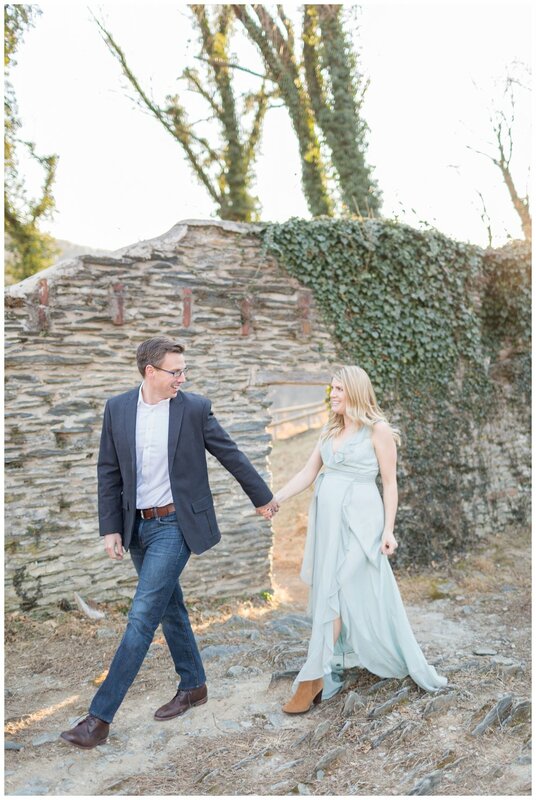 We played around a lot with the potential locations but eventually decided on St. John’s Ruins in Harpers Ferry, West Virginia. This gave the two a natural backdrop with the option for a few water inspired snaps at the end. We had the ruins completely to ourselves. What you may not be able to tell about this session was that it was FREEZING outside. Even with the colder temps, these parents to be had a blast! We joked around as they (very cautiously) climbed all over these rocks. We ended at the shoreline only to be greeted with more wind! I think that Adleigh looks like Kahleesi with all these historic rocks! Instead of the Mother of Dragons, these two will be parents to “Baby R” due March 22nd! I can’t wait to meet their little one this spring!